The Challenge - Did you know? 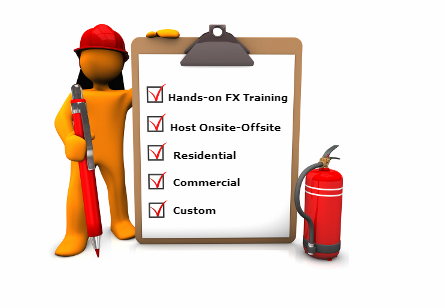 Enroll in Z3 Training Solutions' Hands-on Fire Extinguisher Training Course. Z3 delivers a relevant Education & Training Program. The Program integrates two types of learning environments, online (eBook) and instructor-led. Now, families "on the go" can learn the principles of Fire Safety & Prevention prior to meeting on-site to receive the essential hands-on fire extinguishing training. Our system's environmentally sound approach to training provides a realistic flame pattern that requires trainees to use the proper technique to extinguish the flames. Our extinguishers have the same weight, feel, and discharge time of real dry chemical extinguishers without the mess. So training can take place year round. Call us for group (residential) and business rates. Each workshop runs for approximately two hours and can accommodate groups of 12 to 24. Attendees to this course receive classroom instruction in a supportive and fun environment where everyone is encouraged to get involved, ask questions and share stories. After the review session concerning the “principles of fire & fire safety” is complete, we move on to the practical training area where our environmentally-friendly system is used to give all participants the opportunity to extinguish a real fire in a safe and controlled environment. The system provides a realistic flame pattern that requires trainees to use the proper technique for the flames to be extinguished. Our extinguishers have the same weight, feel, and discharge time of real dry chemical extinguishers without the mess. So training can take place year round. Clean Training Our system uses a conical laser to replicate extinguisher discharge, rather than depending on a dry-chemical or CO2 extinguisher, making it a cleaner way to train. Effective Training Simulate class A, B and C fires at ten difficulty levels. The system can sense if the trainee is using the correct extinguisher, aiming and sweeping correctly, and if they are an effective distance from the base of the fire. This ensures trainees are prepared in case of a real fire emergency. Safe Training Utilize LED-driven digital flames and a laser training extinguisher to provide a dynamic and realistic simulation for trainees while eliminating the hazards associated with conventional fire extinguisher training. We use this same system to help businesses in our community meet their OSHA safety training requirements. Train Anywhere Because only a laser is emitted from the training extinguisher, extinguisher training can now be conducted virtually anywhere indoors or out – where fires may actually occur. Our program is designed to meet the needs of businesses and groups that wish to host a course at their own facility or an agreed upon neutral site. Please contact us to speak to a training coordinator to discuss in detail your location preferences.